Signaling the beginning of a new era for Acura, the re-engineered 2019 RDX is the first in a new generation of Acura products. This reimagined five-passenger SUV delivers top-of-class performance, a more spacious and luxurious cabin, and a host of premium technology and features. Designed, developed, and manufactured in America, the new turbocharged RDX is the quickest, best handling and most luxurious RDX yet. It’s Acura’s most extensive redesign in more than a decade and centers around the manufacturer’s Precision Crafted Performance brand direction. 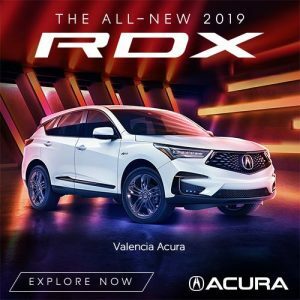 The 2019 RDX’s sumptuously appointed, tech-forward and spacious new cabin features Acura’s latest thinking surrounding a more premium, personal, and connected driving experience. And while the RDX’s exclusive platform, VTEC® Turbo engine, 10-speed transmission, and available torque vectoring SH-AWD® will excite every luxury car enthusiast, it might be Acura’s signature Diamond Pentagon Grille flanked by all-new Jewel Eye™ headlights — boasting seven LED light elements, up from the previous five – that turns heads as you travel Santa Clarita and beyond. Where will your Acura take you?